KEY FEATURES: Tufted perennial grass to 1m, with lemon-scented leaves. LEAVES rough-edged, straplike, to 100x1cm. FLOWERS rare. 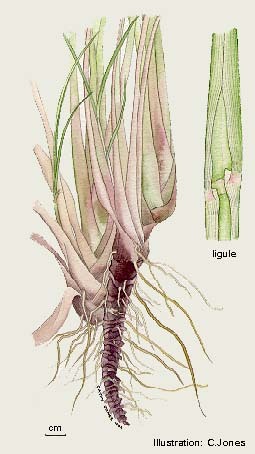 GENERAL NOTE: Oils from leaves and roots of Lemon Grass, and of Citronella Grass (Cymbopogon nardus) used as essences in soaps and perfumes; and citronella as an insect repellant. 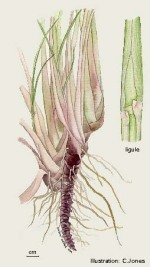 Lemongrass leaves used fresh or dried to flavour foods and to make tea. Cooks: B. Sykes confirms Cymbopogon citratus and not C. coloratus, 3/2001.